My time read 6:08 a.m., and the boat was cruising along the calm waters northbound of Cagayan, towards the island of Palaui. On my right was a burst of orange sky already anticipating the coming of the mighty sun, and on my left was the panoramic view of the mountain ranges of Cagayan awaiting the new day. Aboard that small boat, miles away from the jungles of Manila, was me and the boatman who seemed to just woke up from a bad dream. Then it dawned on me: what the hell am I doing here alone?! The answer came in a heart beat -- because I want to. For more than three years since I started backpacking Pilipinas, I've really never been alone. I have a sister whom I share the same interest with traveling, and friends with whom I share the same passion for exploring the unknown. I couldn't be happier whenever I'm out with these bunch of adventurous-seeking and highly-charged folks. But then there was this nagging idea of solo backpacking that kept haunting me for a long time. I've always thought that every seasoned traveler should go through this brave undertaking once in a while. But now I'd like to think that solo backpacking is not just for usual travelers. It's something that everyone should do and could do -- travel easily alone, escape from the city rat race and find a quiet space somewhere far. Where, when and how were my perennial questions. 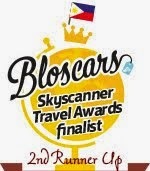 Last December, without waiting for a seat sale, I booked a roundtrip plane ticket to Tuguegarao. Other than the fact that I haven't been there, I had no other special reason for choosing Cagayan Province and Kalinga for my first solo travel attempt. I didn't do extensive research of what I wanted to see and where to go there. Without a hotel booking and a definite itinerary in hand, I was off to a where-my-feet-would-lead-me kind of trip. Immerse and talk to the local people. With no one else to talk to, going solo allowed me to engage in deeper and more personal conversations with the people I met along the way. Manong Beloy and Manang Linda. I couldn't thank them enough for making my trip to Palaui Island truly unforgetable. Manong Beloy is the president of the association of tour guides in the island. Knowing that I was alone, it was so kind of him to send me off to the trail with a packed lunch and he even gave me his own guide sheet as my souvenir! Bless this couple! Manang Eufrocena. This 53-year old woman was my guide for the 6-hour trail to and from Cape Engano. While keeping up with her pace during the trek was a challenge, I will not forget how she handled the whole trip with vitality and aplomb. Along the way, she would share personal stories about her daily life in the island, like how at her age she could still climb trees, do farm works and go fishing with her children! Also, she opposes any plan to construct paved roads in Palaui since she said it would spoil the natural beauty of the island. Kuya Elmer. The van driver who helped me find a place to spend the night while I was in Gonzaga, Cagayan. He was so kind to pick me up as early as 4a.m. the following day so I can still catch the bus going to Santa Ana. And he went through all these troubles without expecting in return! With nothing but gratitude, I treated him for a cup of coffee and pandesal while we were waiting for the bus. Joyce. This girl I met on my tricycle ride from Tuguegarao City to Penablanca entrusted me her mobile number in hope that I could help her find a job in Manila! I didn't give any assurance but I told her to keep in touch. Depend on your instincts. I'm quite aware that a woman traveling alone to a far away destination could be vulnerable to danger. In times when I felt unsure if I would go or let go, I had my commanding instinct to follow. My mantra during the whole time I was there was "to go home in one piece." Be frugal, but don't miss out on the essentials. As a poor-packer and with no one to share the "damages," I had to watch out for every peso I spend. There were several times when I was confronted with "tough" decisions between staying comfortable or keeping up with my finances: aircon or fan room, coke or service water, hike or trike, 14 km trek or P1800-worth of boatride, civet coffee or 3in1, extra rice or no extra rice, to buy souvenirs or not to buy souvenirs. In the end, I just tried to balance-out how I can get the most from the experience without crippling my finances. Keep the A-attitude. When the going got tough along the way, I had to close my eyes for a moment and tell myself to just enjoy the ride! Chase the sunset and the sunrise! This is a daily phenomenon, though quite trivial to some, that I don't get to experience in a "want-to-basis." So in every trip, I make an effort to catch the dawn and the dusk. For me, these are also the best moments to romance my camera with amazing captures. Walk, hike, trek! Aside from financial reasons, I decided to do some cardio workout by going the long way and stretching out my muscles a bit. I would have missed the view of the green mountains, the stream, the birds doing their vocal workout and wild flowers of Palaui had I decided to take the banca going straight to Cape Engano. Thank you God I have strong legs! Soon, there will be home. Probably the most profound idea I had while traveling solo was that feeling that the trip was just a fleeting experience. At the end of it all, I still have a family waiting for my return. And by then, I'm not so alone anymore. 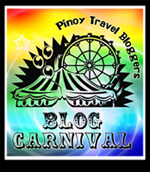 This post is my entry to Pinoy Travel Bloggers' Blog Carnival for March 2012. With the theme "Leap of Faith: When Traveling Changed My Life," Reiza Dejito of Wander If You Must hosts this edition of the blog carnival. I can't find the theme that you said at Estan Cabigas' page. It's not included in the list. nahiling ko na. ang urag kang pagkaka-link ng mga blogs! Immersion is the way to go! Cheers to solo backpacking (which I totally miss, LOL). i really wanted to do what you did..always thinking about it but i have no guts to do it .. reading your footnotes excites me! The biggest issue na lng is ung cost coz I have no one to split it with..
Hi Jennifer, totally understandable yung cost issue. Yun din ang prob ko when on solo trip. pero i usually work around my budget by staying in a cheap, but comfy place. since i do tours all day, hindi naman talaga kelangan bongga ang tulugan for me. hehe i don't recommend staying in a tent overnight alone, for safety reasons. :) Have an amazing and safe trip!!! For me knowing it all greatly keeps on helping things to us and that's the way for me nyc to niagara falls bus tour is always appealing and because it has a lot of input we can get to have a way out.